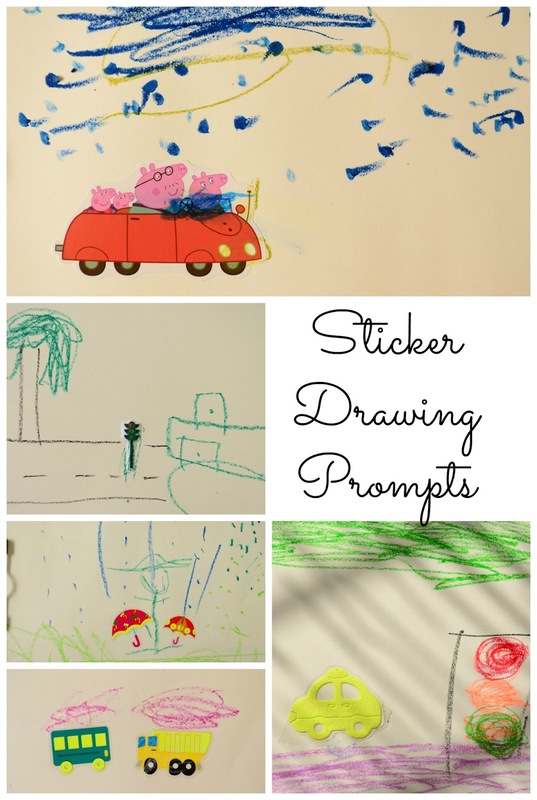 Sticker Drawing Prompts are easy to prep *and* non messy! Most parents will have sticker and chalk/crayons/pencil/pens handy. 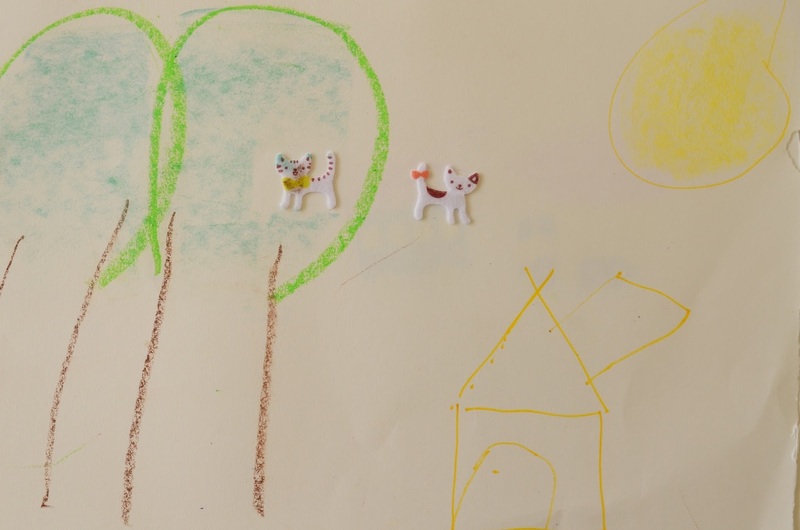 It’s great to boost kids imagination, drawing skills blah blah…..It's totally fun to witness what goes on in your kids minds! Putting a sticker (or a few of them) on their drawing sheet prompts them to draw something else. You may need to give em a few ideas at first so they ‘get' the concept. But after a few tries, it free flows like a charm! My 3.5 y.o graduated from drawing with chalks to drawing with crayons, i.e after I tossed out all our insipid wax crayons and introduced rich and beautiful oil pastels! I prefer Navneet’s set of 50 to Camlin’s as they have some cool shades (incl 4 fluorescent ones!). The first one I stuck on his drawing sheet were two cats. I nudged him a little, what can you draw around cats? cats love trees! cats are fed by people living in homes! etc. Then I pasted a dump truck and a bus. So he drew some debris that was carried by them! When I pasted a car sticker, he tried to draw another car. a traffic signal. From his Peppa Pig activity book, I stuck Peppa’s whole family in a car. So he first drew a large umbrella. Then rain drops. and Then if you notice the blue smudge on the windscreen of their car, thats rain that is being wiped by wipers going swish swish swish! Ice cream sticker prompted him to draw another ice-cream cone. Umbrellas prompted him to draw rain and himself holding the umbrella. Some grass too. A traffic signal prompted him to draw a van (while I drew the road and tree trunk) he drew the tree top. Like I said easy to set up *and* non messy! The key here though is to refrain from over prompting. Like I try hard not to blurt out “But the sun is yellow, not magenta” or “why is there grass in the sky?” The fact that it doesn’t make sense to us doesn’t mean it doesn’t make sense to them! Free thought and Free expression. Let’s not put em in a box already, and let there be ice-cream trees growing out of ponds! I LOVE this and will be pinning it! It's not only great for my toddler but 1st graders as well (I teach). Thanks! A great way to spark drawing AND storytelling! Love it! What a fun idea for the little ones. Love the sticker idea. Thank you for sharing with the Clever Chicks Blog Hop! I hope you’ll join us again next week! My daughter loves to draw and use stickers and now I'm anxious and curious to see her put both together! What a great idea! What a wonderful idea! My kids would have loved this when they were little. I'll be sending some pages with this idea to my Compassion sponsored kids! Thanks! This is a great idea! Thanks for sharing at the Home Matters Party. 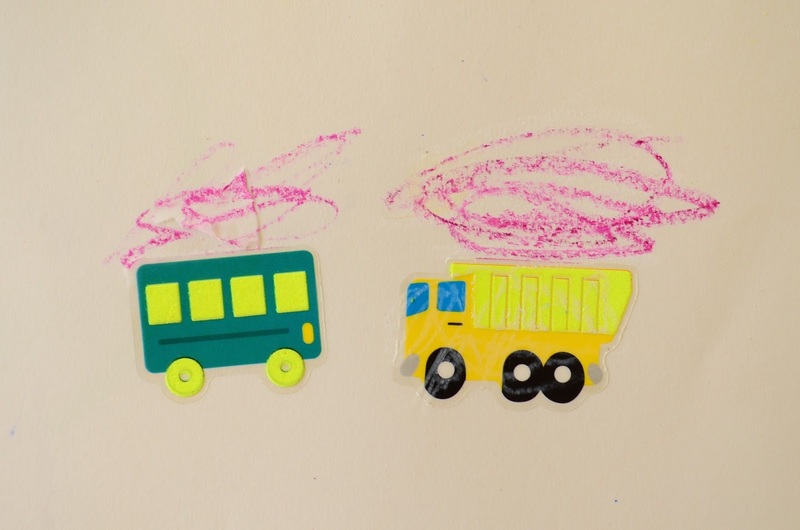 I will definetly be trying this with my almost 3 year old who loves stickers! Also, I can't help but notice all the other cool stuff you have on your site. New fan here! I love the idea of using a sticker to prompt the artwork! Thanks for sharing with SYC.